Herrmann Dunn Real Estate Inc.
Herrmann-Dunn Real Estate, Inc. is a commercial real estate company located in the Annapolis Historic District, owning and operating some of the most prestigious office space in the area. 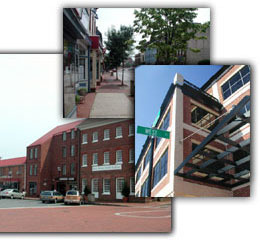 The primary focus of the company is the developing and leasing Class A office space in downtown Annapolis, with an emphasis on the thriving business community along West Street. The company is also active in commercial property management. Phillip Dunn, the majority owner and manager of Herrmann-Dunn Real Estate, Inc. currently manages buildings at 30 West Street, 44 West Street, 115 West Street and 151 West Street in Annapolis. In 1979, Mr. Dunn purchased the West Street bus station. After forming a partnership with Baltimore developers Godine & Stunda, the new partnership developed and built the Annapolis Hotel. In 1989, Mr. Dunn brokered this hotel to the Loews Corporation. Dunn Development Company purchased the Herbie Sadler property in Eastport, and developed O’Leary’s Seafood Restaurant. In 1995, Mr. Dunn began assembling the property that is now the site for the new office building at 151 West Street. Mr. Dunn participated in the design, development and construction oversight for this building. The building is 100% leased to credit tenants. Mr. Dunn purchased and rehabilitated the Middleton Art Gallery, located at 30 West Street in Annapolis, in 1996. This 9,000 square foot Gallery, portions of which date to the 1760’s, was successfully converted to Class A office space. 30 West Street is 100% leased. In March 2000, Mr. Dunn and his partner purchased the Judson Martin Jewelry building at 44 West Street. After extensive archeological studies, this building was rehabilitated into 5,000 square feet of Class A office space with four parking spaces. After an extensive build out, the entire property was leased to the University of Maryland. In 2000, Mr. Dunn and his partner purchased the Satellite Auto Glass site at 115 West Street. This site has been transformed into a dramatic Class A office building. This four-story 22,000 square foot building is located on inner West Street, directly across from the award-winning Annapolis Loews Hotel, and is in the heart of the West Street Revitalization District. This premiere location also features a magnificent fourth-floor view of the City of Annapolis and the Naval Academy and is within walking distance of many of Annapolis’ most loved highlights. And best of all – it’s now available to lease.